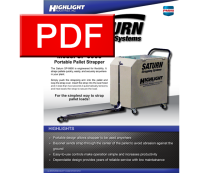 The Saturn™ SP-9900 Pallet Strapper is engineered for flexibility. It straps pallets quickly, easily and securely anywhere in your plant. Simply push the strapping arm into the pallet and loop the strap around the pallet. Insert the strap into the seal head and in less than two seconds it automatically tensions and heat seals the strap. For greater flexibility, Highlight Industries offers a rechargeable battery option, making the SP-9900 truly portable!